Vlog #2: I’ve Got GREAT News!!!!! And as promised in the vlog, here are the selfies I took at work when I signed the contract! I’m so excited about what God is doing in my life and I’m truly grateful for each of you. Your encouragement and the community we’ve created here keep me going. I’m looking forward to all the wonderful things that the future holds for us! Let’s get it. What are you believing for in 2016? Say it out loud! 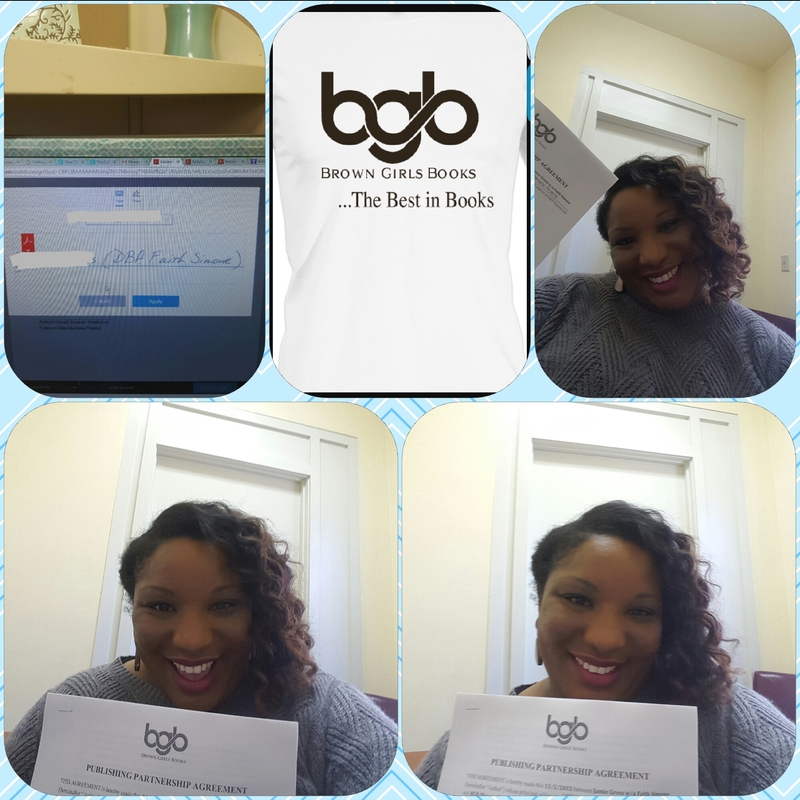 I’ve written two chicklit bestsellers and I just released a Christian novel. I am a part-time writer. I spend the latter half of my day creating on my laptop. I believe you make time for anything you want to do; since writing is like breathing to me, I make it a top priority and care out time for my work each day. I write every day. My most productive creative time is around 4:30 or 5 am. I work for three hours st that time of day where the words and ideas just flow. I think I’m just more clear and fresh at that time. Then in the afternoon, I put in another three to four hours. Hey. That’s about six or seven hours. I guess I do write full-time! I kept a journal in the early days just to help me organize my thoughts and ideas. But now, I have a goove where a character starts talking in my head and then I build from there. I always know the end of my stories from the beginning and somehow I’m able to keep all the details straight because I become pretty engrossed in their fictional lives. I’m an observer and a people watcher, like at the grocery store and subway or if I’m seated by the window of a restaurant, I LOVE watching people walk by and wondering what their story is, based on how they’re dressed or what they are doing in that moment. I also listen to things people say and love the cadence, the rhythm of conversations. 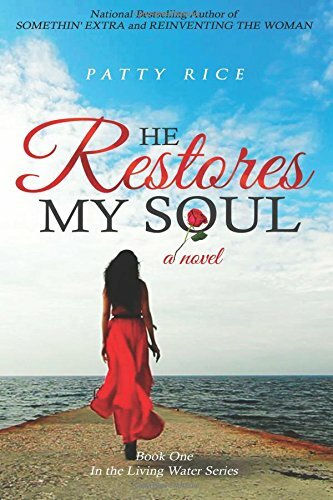 The new book, “He Restores My Soul” came from a conversation some of my friends were having about how they felt about black men dating and marrying white women. That moment was so interesting because I was meeting a black colleague who was picking up tix from me to an event. He is very handsome and walked in with his white wife, and the four women with me were so disappointed. I knew I had to recapture that moment in time and present it in my work, really look at why that issue might exist. It was so much fun to write about! I want a body of work that makes my family proud, but most importantly, I want God to be pleased. Words have a profound impact and it is a vital responsibility to have a platform. I want people to be encouraged, edified, and entertained. Start journaling if you aren’t already and write every day. Stick with one story and be a finisher. Too many people start and stop projects and never get anything done. Read a lot of books by the best writers and study their techniques, and take a grammar class every few years, as well as participate in writing classes, workshops, and join a writing group. These are things that most serious writers do. I read a lot of Christian Fiction and Romance. I just finished Vanessa Miller’s Praise Song series and one of the best romance novels I’ve read in a long time is, “Perfect” by Delaney Diamond. I also read a lot of biographies and autobiographies. I just read since April Nile Rogers, Toni Braxton, Norman Lear, Penny Marshall and Garry Marshall. All awesome reads! I have two things going. I’m actually developing a half-hour scripted show with a friend as well as working on the second book in my Living Water series. It’s called “Love and Reverence.” I thought it would be interesting and helpful to marriages on the brink out here if I looked at how a failing Christian marriage can be restored after the trust is broken and both sides have caused careless pain. The characters will be implementing some of the tools God taught me as He restored my own marriage. I’m big on the message of restoration. Former Assistant Pastor Martin Fisher abandons his family for his much younger, white pregnant girlfriend and everything goes haywire. 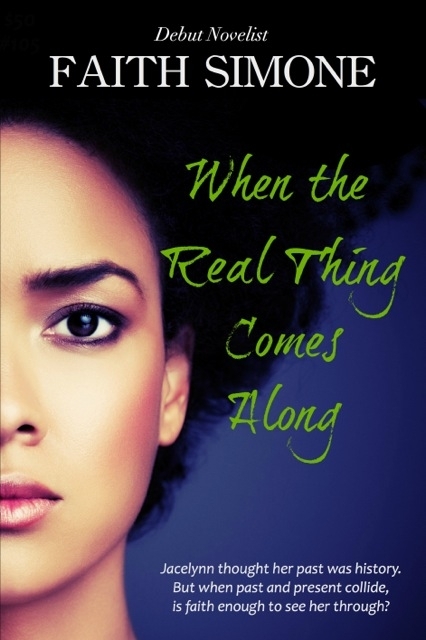 His frigid wife, Justina puts on a good face in public, but privately she copes with anxiety pills and struggles between finding a new identity and giving up on life completely. Their daughter, Zina comes face-to-face with a crippling, long-buried secret just as she’s about to take the biggest risk of her career. Meanwhile, the Fisher’s son, Ryan decides he must bring stability by starting a family with his wife, Sierra, only to discover that her dark past just might railroad his best-laid plans. With the Fisher family in ruins, will they ever be able to let go of their pride and allow God to bring wholeness? Or will they continue to suffer the relentless consequences of bitterness and unforgiveness? The twists and turns will leave you breathless! Zina Fisher is a smart, funny, and ambitious beauty with absolutely no filter. She’s very high strung, and because she grew up sheltered by her family, she thinks she can have it her way every day. Someone sassy would have to play her who can fuse their natural fire into the character, like Zoe Saldana. If we pushed slightly older, I would say Gabby Union. I love her advice for aspiring writers! Just do it, and study the greats. You can’t go wrong by following that wisdom. Feel free to ask Patty additional questions in the comments below! What’s your #1 goal for 2016? What are you afraid to do, that you’re going to do anyway? Don’t leave me hanging. Let’s do this together and make 2016 our best year ever!